Will Rooney's ban mark a watershed moment? With Wayne Rooney's two-match ban for using foul and abusive language upheld, Club Website editor Dan Pope wonders if this will mark a watershed moment for the FA's hopes of improving player behaviour. Not for the first time in his career, Wayne Rooney has found himself in the media spotlight again this week. Since he swore down a TV camera while celebrating his hat-trick goal at Upton Park last Saturday, the United striker has been at the centre of another football furore. Having admitted a charge of using foul and abusive language - I'm no lawyer, but that looked a wise move considering the evidence - Rooney was "gutted" that the FA's automatic two-match ban was not reduced on appeal. "I am not the first player to have sworn on TV and I won't be the last," said Rooney. It is a fair point and one that will, no doubt, be proved a correct one. But to argue that he is the only player "caught swearing on camera" to have been banned for his actions is missing the point somewhat. Swearing on the pitch is one thing, but to swear directly into a camera during a live TV game, with millions watching at home, is quite another. 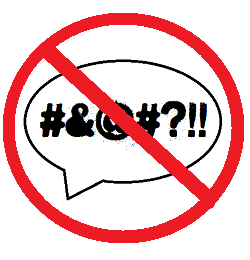 Of course, swearing happens in football - the adult version at least - whether the pitch in question is at Wembley Stadium or Hackney Marshes, but when a Premier League star does it so blatantly, others are likely to follow suit. "Saw a 12yo 'imitate' Rooney's "F off" celebration this morn. Respect campaign must be enforced at top if it's to be credible at grassroots." Rooney's comments weren't aimed at a referee, but were sympomatic of the sort of player behaviour that many fans have become fed up with. The Premier League announced last Friday that they will be clamping down on “offensive” behaviour from next season, while 53% of over 4,000 Club Website members polled believe the issue of Respect can only be sorted at grassroots level if the professional game set the right behavioural standards themselves. So where do the FA go from here? Will Rooney's ban be a one-off incident just to serve as a warning to other players - something which would give United fans just reason to be upset - or will the governing body treat it as a watershed moment and ensure that all unacceptable behaviour on the field of play - whether directed at TV cameras or referees - is dealt with in a similar manner in the future? 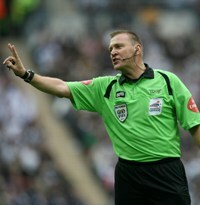 Ex-Premier League referee Graham Poll believes the governing body must take the opportunity that is presented to them. "At last... the Football Association has found the backbone required to run the national game and be called its custodians," said Poll. "It has missed so many opportunities to make a stand for decency, but what follows now is really important. Referees are asked for consistency and the standard-bearers of the game must also answer that call." Poll was infamously sworn at 27 times by Rooney in one half at Highbury in 2005 without sending the player off. He has since admitted to being instructed to "manage" under-pressure players rather than throw the book at them, but he hopes this approach may change. "Now the FA must wrest control of referees from the spurious Professional Game Match Officials Limited and instruct them to apply the law and earn respect, not allow the Premier League to promote further 'management' of players' excesses." At grassroots level we must all do our part to ensure that our behaviour and that of our team mates is of the highest standards, while coaches and parents must ensure that children learn to behave the right way on the field of play, as they do off it. However, kids will inevitably copy their idols, so for the Respect programme to be a success at grassroots level we must have positive role models at the top of the game and they must be consistently punished if they step out of line, as Rooney has been. Many United fans feel their team has been victimised and Rooney has been singled out for special treatment. The FA has the opportunity to prove otherwise. Will they grasp the nettle and use the Rooney case as a springboard to really improve player behaviour and respect throughout the game? Or will the United fans' views be vindicated? The opportunity is there. Let's hope they take it. Respect towards referees is back on the agenda. Can the problem ever be sorted at grassroots level without the professional game leading the way? said it’s still up for renewal on 27 April.